Last night, I planned a trip with MIL for all of us to go out for breakfast. Also we planned to go to the Collingswood (NJ) Farmer’s Market. So today we left the house at 7:30 AM, driving to one of our favorite diners to eat at. DH ordered creamed chipped beef, MIL ordered pumpkin pancakes which they both thoroughly enjoyed. For me, breakfast out was a bust, as something was odd about the Belgian waffle I ordered. I think that there was either too much malt or the milk was sour that was used to make the batter. This was a surprise as I normally love their waffles. From there we drove the 19 miles to Collingswood. The farmer’s market is pretty extensive with lots of goodies. It features lots of Jersey fresh vegetables, fruits, home-baked desserts, breads, fresh clams, jerky, and much more. It is located in a parking lot under the elevated High Speed Line. We purchased baby golden beets, sweet potatoes, butternut squash, portabella mushroom caps, Gala apples, Jersey peaches and baby striped beets. While there, I tasted pumpkin rice pudding which was okay, however the peach cider was delicious. I actually bought a 3 pound package of butternut squash already cleaned and diced, which was a pleasure. Peel, remove seeds and dice multiple squash into 1 inch sized pieces. On the stove, put them in a pot full of water just enough to cover them by 2 inches. Bring to a boil, then reduce to medium low, cover and cook for 60 minutes or until squash pieces are tender. 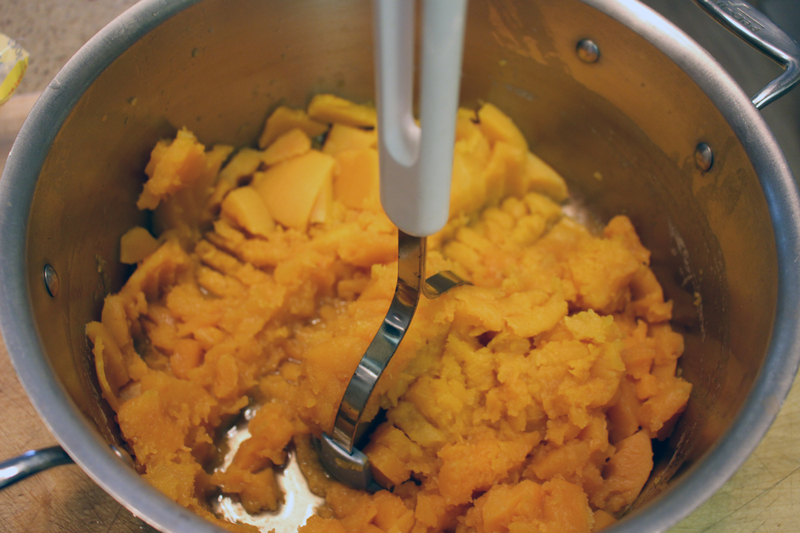 Place cooked squash pieces back in pot and finely mash them with masher. Add brown sugar, 4-tablespoons melted butter, flour, baking powder, pumpkin pie spice, salt and vanilla mixing it well. Lightly whisk eggs together then pour them into squash mixture. Use pat of butter to grease a square 9″ x 9″ baking dish with a paper towel. 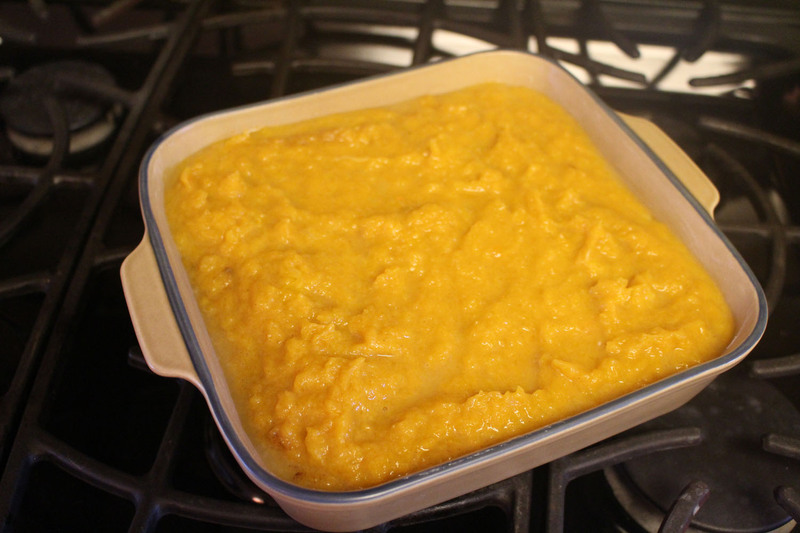 Place squash mixture into the baking dish and even out to one level.